Happy Friday! 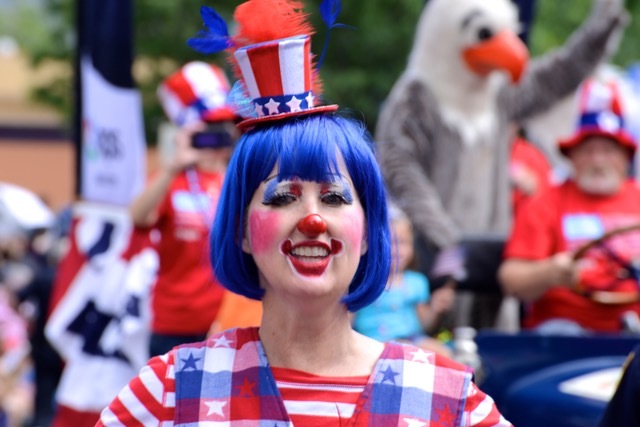 This week’s photo feature comes to us all the way from Flagstaff, Arizona, featuring a participant in the annual downtown 4th of July parade. With the holiday weekend upon us, we wanted to offer up a few safety tips to help keep your 4th of July fun! Wear and reapply sunscreen. This year, let’s keep the red meat on the grill instead of on your body. Make sure you wear and frequently reapply sunscreen if you’re hanging out for a backyard BBQ! Also make sure you have a hat and sunglasses that block out UVA and UVB light to protect your eyes. Stay hydrated. This is especially important if you’re celebrating outside at a parade and standing around in the hot sun. Bring extra water bottles to stay cool and beat the heat. Beware of fire restrictions. Some areas are particularly dry this year and are at a high danger for wildfires. If this applies to you, leave the fireworks to the professionals. Pay extra attention to your furry friends. Fireworks can be very scary for your pets, so be sure to bring them inside before the festivities start and give them a little extra love. What are your big plans for this year’s holiday? Let us know in the comments! Stay safe and have a happy 4th of July from all of us at Touch the Southwest.